Inside a 25 foot silver trailer on South Lamar and Mary Street in South Austin, unwanted pets are getting a second chance at life. Red, a Pitbull mix, was scheduled to be euthanized Thursday morning at Town Lake Animal Center. He wasn't alone. Shelly a Border Collie mix, and Bitsy and Ridgy two Chihuahuas were also scheduled to be put down. They were all saved by Austin Pets Alive. The animals are vaccinated, spayed and neutered, micro-chipped and put up for adoption. In 2008, more than 10,000 dogs and cats were killed at Town Lake Animal Center. 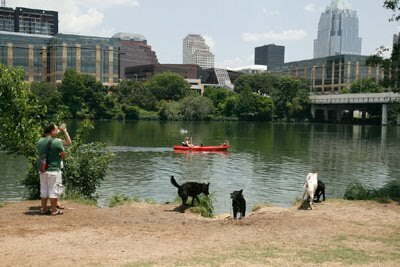 Thursday, the Austin City Council moved a step closer to making Austin a "no-kill" city for animals. In a unanimous vote, council members directed City Manager Marc Ott to save more dogs and cats from death. City staff will work with members of the city's Animal Advisory Commission to prepare a plan. The plan calls for an adoption program with off-site adoptions seven days a week, and a large-scale foster program with low-cost spay/neuter services.It also recommends ending the killing of any healthy or non aggressive dog while kennels or cages are unused. The plan calls for a 90 percent save rate as a goal for Austin. Dorinda Pulliam is Executive Director of Town Lake Animal Center. She says the shelter has made progress when it comes to euthanasia. “Our euthanasia rate dropped significantly this year down to 32 percent to 7,000 compared to 10,900," said Pulliam. Still for Lindsay McCay and other animal advocates, their mission won’t be complete until every animal has a second chance at life. The resolution will come back before the council in March.